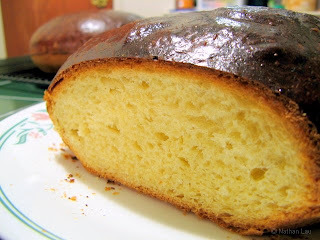 Growing up, we used to have slices of King's Hawaiian brand Portuguese Sweet Bread for breakfast. The bread had a sweet, eggy crumb and a dark, almost coffee-flavored crust. I'd smear on pats of spread and devour the loaf. It would be gone within a few days. 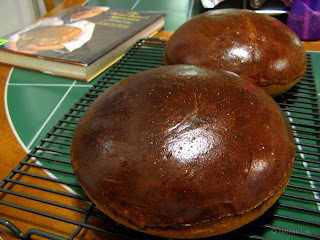 Annie found this recipe from "The Bread Baker's Apprentice" that was quite easy to do and produced two wonderful loaves. The crust was soft and delicious while the cumb was tight but light. We gave one loaf away and kept one for ourselves. The kids devoured the loaf within a few days. Oh, this is the second time I've seen a dome-shape loaf this week. WoW! It doesn't taste exactly like King's Hawaiian. What a wonderful bread!!! I've not heard this Portuguese sweet bread. Is it easy to prepare it? Pls send its recipe with step by step instructions.